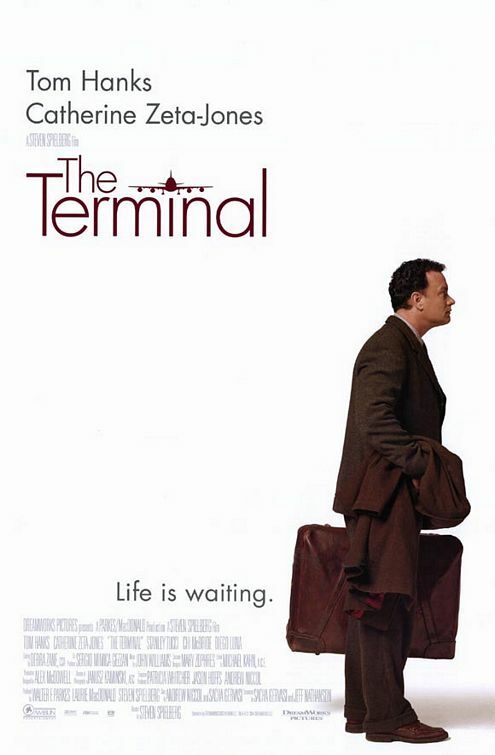 Spielberg's first film to truly address the changing American landscape after September 11, The Terminal is at once a key point in his development and one of his most instantly forgettable movies. 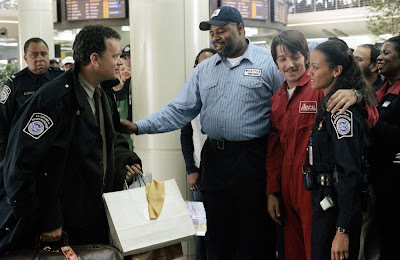 Shot on a titanic set intended as a sort of tribute to the great comic canvases of Jacques Tati, The Terminal confines its action to the most logical of starting points when unpacking the effects of 9/11: an airport. The first shots roll over Customs & Border Patrol setting up for the day at JFK International, cordons being set up to direct incoming travelers as dogs make a quick scan of the place. Soon, the people pour in, travelers of all different nationalities cramming into lines and handing over passports and declaration forms as they are screened by officials in booths. Then the camera pulls back to reveal that these measures are but the first step of heightened security. Above it all, more officials watch on surveillance cameras for any anomalies, the airport now looking more like a casino than a transportation hub. In a few minutes, Spielberg deftly casts a world of total monitoring, where excuses and intentions don't matter. If someone catches an error, arrest and deportation follows swiftly. In this new world, the prospect of travel seems more frightening than exciting. The basis of the film is the story of Mehran Karimi Nasseri, an Iranian refugee who spent nearly 20 years stuck in limbo at Charles de Gaulle airport, unable to enter France itself or to return home. Spielberg and the writers swap an Iranian in France for a fictional Eastern European in America: Viktor Navorski (Tom Hanks) arrives from the former Soviet republic of Krakozhia just as a coup overthrows and delegitimizes his government. Everyone in the airport is evaluated by their printed identities, and on paper, Viktor Navorski effectively no longer exists. Yet this change of nationalities has the effect of innately undermining the film's relevance. Though Nasseri's plight precedes the release of this film by 18 years, his situation fits neatly into the modern landscape of Middle East tensions. Navorksi, on the other hand, is a relic of the Cold War, a means of divorcing the film from a specific time period in what feels like a safety precaution. It also allows the leading man to be a comically bumbling white man instead of a politically contentious Muslim. And from the second Hanks appears on-screen, it's obvious that the film's toe-dip into any political commentary will take a back seat to awkward slapstick and translation humor. 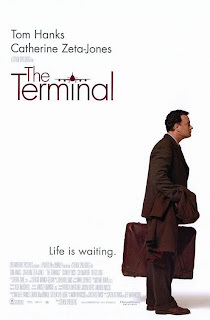 Hanks lets his face slack with a combination of awe and confusion, Viktor's language barrier and enthusiasm for visiting New York preventing him from remotely understanding why he must stay in the terminal. He slips on wet floors, walks into glass doors, and repeats his pre-set list of English phrases until the plot finally calls for him to learn some English to prevent the loss of audience goodwill. It's fun to see Hanks slip back into his early, comedic tone, but he cannot square the zaniness of Viktor with the shock on the man's face as he watches his country fall on television, or when he must become serious later to help those he meeting in his stasis. 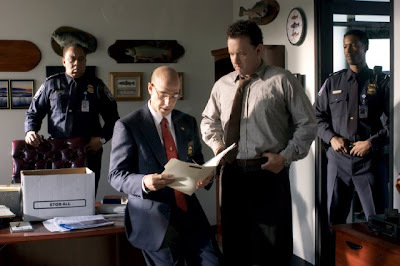 It's a two-dimensional performance that requires an equally thin villain, which Viktor receives in the form of Acting Field Commissioner Frank Dixon (Stanley Tucci), some meaningless bureaucrat who behaves as if he's the head of Homeland Security. Having spent his life sucking up to his superiors and getting ahead of his peers at any cost, Dixon does not understand the concept of basic humanity. He's spent so long looking at people's documents that he cannot process the actual person, save to look for inconsistencies in their story. He can catch out a group of Chinese "tourists" to Disney by noting their lack of cameras, or see through a drug smuggler's cover of buying brazil nuts for his mother-in-law by noticing the lack of a wedding ring. But when a confused man begs to bring in medicine for his father without the proper forms, Dixon feels nothing. Admittedly, he's the closest the film comes to suggesting a connection with the times. One of the head customs officials, Dixon speaks no language but English and has no translators on-hand to deal with those who cannot understand his fast-talking bureaucratese. He "explains" the Krakozhia coup to Viktor in terms that would baffle a native English speaker, then gets annoyed at the man's incomprehension. But these realistic caricatures give way to a full-on antagonist, Dixon raging at Viktor's presence without reason, so terrified that Viktor will ruin his ascent that he does everything he can to entrap Viktor into getting arrested and deported, or at least detained somewhere else. His wrath is never given clarification nor purpose, and the rest of the film is too optimistic for his baseless fury to be any kind of commentary on the xenophobic practices of Homeland Security. Dixon's lack of solid character foundation is but one part of the larger absence of meaning that hobbles the film. Charles Taylor of Salon called this Spielberg's worst-directed film, and I'm inclined to agree with him. The set, though impressively detailed and filled with extras, feels lifeless and clearly artificial thanks to Spielberg's awkward direction. His camera, normally so jubilant and free, moves with clumsy stiffness, maladroitly careening into close-ups rather than evoking that euphoric quality of the "Spielberg Face." And frankly, the dimensions and layout of the terminal make no sense. Repeated shots of certain locations establish the repetition of Viktor's caged life, but the lack of connectivity between these areas creates a potentially limitless space. Where, for instance, is that dilapidated airplane gate where Viktor sleeps? With its ratty disrepair and inactivity, this part of the set looks like some weird post-apocalyptic vision of the terminal, as if the original shooting script included some nightmarish vision of another terrorist attack and its aftermath before that plot point was dropped halfway into production. It's not like Spielberg can't handle confined spaces: watch his direction in the opening of Amistad or on the boat in Jaws. Held in by the dimensions of the respective ships, Spielberg swaps his dollies and cranes for tilts, pans, and judiciously cut static shots. In both cases, Spielberg generates suspense and momentum while also clearly defining the limitations of the setting. The terminal here is technically limited, but Spielberg's made it so big as to trap the movie between being too small and too large, sapping the movie of its tension. The airless feeling created by The Terminal's flaccid direction rends apart the already threadbare plot mechanics driving the film. Tucci's villain is consistently made simultaneously more cartoonishly vile and more impotently meaningless to the overall story, ensuring an easily hated antagonist who ultimately cannot truly be cruel. Furthermore, the other people Viktor meet simply pad time, be it the catering car driver (Diego Luna) who pines for a CBP officer (Zoë Saldana) or the Indian janitor (Kumar Pallana) who's fled prosecution back home for three decades. Then, of course, there's the romance between Viktor and flight attendant Amelia (Catherine Zeta-Jones), a subplot so tacked-on it makes the stuff between Leonardo DiCaprio and Cameron Diaz in Gangs of New York look as natural and integral to the film as the love story of Before Sunrise. Everything feels like a distraction from the things Spielberg wanted to say but was too afraid. For his first explicitly post-9/11 film, the director chose a contentious subject, but he goes so far out of his way to be inoffensive that nothing in the movie sticks. As previously stated, the giant set of The Terminal pays homage to Jacques Tati and his masterpiece (and one of the greatest of all films), Playtime. By setting his film in an international transit terminal, Spielberg subtly gets to show the world coming to America, a sly commentary on our sudden and belated realization of the planet around us. In a way, it's the flip side of Tati's film, which comes from a European sensibility to posit a future where utilitarian American modernism has stripped the world of its multiculturalism. The giant scale of Playtime is a deliberate counterpoint to the modest level of postwar European film, the bombastic 70mm canvas its own joke at the expense of needlessly gargantuan excess. But Spielberg's set, huge and controlled as it is, is practically a step down for the director in terms of siz. Playtime was larger than this, but it still felt like a prison. Spielberg allows his terminal to feel too livable to make his points. Tati's film, set in a vague future and from a European sensibility, more explicitly crafts a globalized world, where modern architecture obliterates culture and makes for a world with uniform buildings and behavior, where landmarks are but a distant memory. But Playtime is also human, its escalation of absurdity and dismantled mise-en-scène coinciding with a liberation of the caged human spirit. Spielberg is approaching his subject from inoffensive angles to maximize commercial viability, but beneath all his slapstick are darker implications of modern America that he cannot yet bring himself to explore. The Terminal is a film that attempts to make farce of American policy but also doesn't want to truly demonize it. It therefore frames the changing landscape of America's public face around a freak occurrence of bureaucratic anomaly. In so doing, The Terminal ends up saying nothing about the fears of our rude awakening to the world's evil and our less-than-stellar response to this fact. Sandwiched between the fluid comedy-drama of Catch Me if You Can — which handles the shifts between broad comedy and heartfelt drama far better than this — and Spielberg's 2005 films —which treat 9/11 with far more maturity and filmmaking prowess — The Terminal has already been all but forgotten. This may not be a bad thing. I kind of have a soft spot for this film. I really liked Tom Hanks' performance. Notably in the smaller moments where he would get all of these luggage carts around the airport so he can have money for a meal. I also liked seeing Kumar in the film. The dude moved up from being in a bunch of Wes Anderson films to being in a Spielberg comedy. I agree about the Hanks-Catherine Zeta-Jones scenes. They didn't work for me either except for the way Hanks is able to remain silent and listen.